When I was discussing the Orrington article with Roger Marsh, editor of the monthly MUFON UFO Journal, in order to secure permission to reprint the account, he mentioned that MUFON has a need for involvement from Maine members. MUFON is interested in increasing it's Maine membership, and more particularly in encouraging Mainers to become Field Investigators. 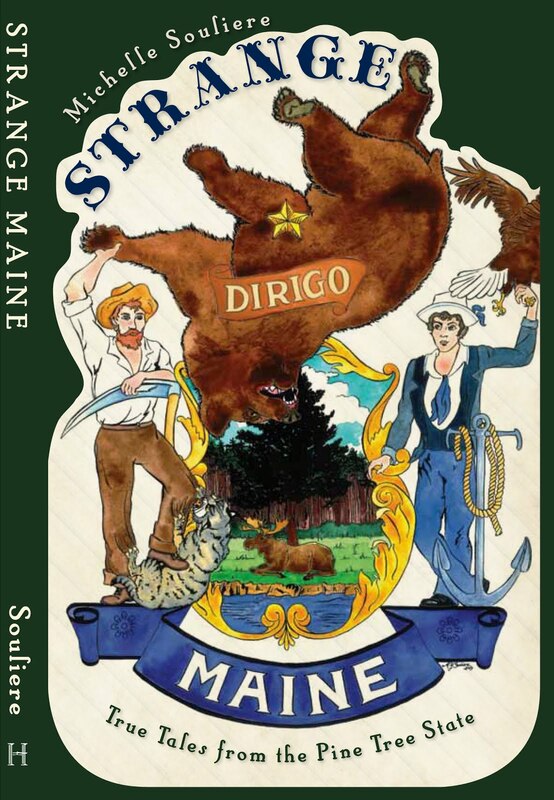 Roger Marsh states, "We need good paranormal investigators and we need a lot more help in Maine these days. We have a new program launching soon where we are specifically reaching out to paranormal investigation groups to see if they want to cross-train with MUFON and additionally become UFO investigators." Marsh continued by mentioning that there is often a similar background shared by the two groups, and that MUFON's past experience has shown that those with paranormal investigation backgrounds work very well as UFO investigators. To find out more about becoming an independent MUFON field investigator, please see their information page here: http://www.mufon.com/become-a-field-investigator.html Information about the new program for paranormal investigation groups will be forthcoming. Marsh also mentioned that MUFON currently has their own show on the History Channel, called Hangar 1, which has been airing on Friday nights at 10:00 p.m. EST. Periodically I check MUFON's database to see what's been popping up over the horizon in Maine UFO sightings. May was a busy month -- 4 reports! -- and there were 18 Maine reports filed altogether in the last 6 months (although 6 of the 18 were from prior time periods, retroactively reported, ranging from August 2014 all the way back to 1954). But it's the sighting from June, coming out of Orrington, that really catches the eye. This report also includes an eyewitness drawing, shown below. Text and image from the report are reprinted by permission of MUFON. Please visit their site at http://www.mufon.com/, where you will find many more Maine reports and current UFO news. 13 June, 2015 just after 9:00 PM driving NORTH on ROUTE 15 after leaving "Snow's Corner" gas station in Orrington, Maine. 100 to 200 yards from my turn off to the right, just before the Orrington-Brewer town-line, I saw a bright teal object slightly above the trees to the North-Northeast going slightly above the tree tops, then dipping below with some lateral motion back and forth as it did. It was "triangular" but had a round shape with smaller circles underneath. It illuminated a teal color seemingly from within as the surface "glowed" teal, with black features on it. At one point it tipped slightly away and I could see the bottom of the object. Lastly, it went below the trees one last time and I did not see it again. This sighting lasted less than one minute, but more probably less than 30 seconds. I pulled over in my truck and tried to see it from the next road down from mine but could not. I then parked my truck and went inside to grab my 10x50 magnification binoculars and ran back to route 15 and walked down to the train-tracks that go across route 15 in Brewer, paralleling the river - but the object was no longer visible. I though I might find some people outside using a drone of some sort, but there was no one outside that I saw. There was also no differentiation in color scheme of the lights to indicate a bow/stern or port/starboard configuration for night flying. At this time I called a family member to tell them what I'd seen and the call was made at 9:28 PM per the phone's history. This object was clearly not a conventional aircraft and moved very quickly back-and-forth and up-and-down. The color was almost as bizarre as the behavior itself. It repeated the "1" > "2" steps several times, and the "3" > "4" was it disappearing out of view and below the tree line in that direction. Orrington is located near the Penobscot River corridor, and in recent years the surrounding area has had a history of UFO sightings. Another Orrington sighting from May 24, 2010, mentions something that "Looked like a very bright star. Made wobbling movements, then stood still. Stayed put for 30 minutes then slowly moved down below tree line." Digging back into the newspapers, I found at least one Orrington sighting decades old. In the Bangor Daily News of June 15, 1978, the headline hollers: "Object in sky upsets Orrington woman." Like this year's June sighting, this one took place on Route 15, and similarly late at night (11:00pm), also near the Orrington/Brewer town line. The woman, who preferred to remain anonymous in the article, reported the incident to the state police, the FAA's radar tower at Bangor, the Bangor Police Department, and an Orrington constable. What she reported was this: a huge red ball of light, "radiating a lot of heat," passed over her car at Wheeler's Hill on the Orrington/Brewer line. She felt electrified as though being shocked by a high voltage, her car radio went crazy, and her headlights went out. She reassured readers that unlike in the movie "Close Encounters," no papers or loose articles flew around inside the car. After running her car off the road in a panic, and finding herself unable to rouse anyone in the one nearby house, she flagged down a pickup truck whose owner kindly drove her home, though he arrived several minutes after the incident and had not seen anything himself. No one else in the area reported any commotion, and the FAA logged nothing on its radar. The last she saw of the UFO, it was headed off toward Hampden. So if you live in Orrington, perhaps a look upwards now and then would serve the curious among you well! An aggravated case of hazing occurred at Bates College Friday night, when a party of sophomores broke into the room of C. E. Hussey, a freshman from Farmington, their purpose being to cut off his whiskers. He screamed for help and to smother his cries they held the bed clothes about his head. Having accomplished their object and fearing discovery by reason of his outcries, they struck and beat him in a cowardly manner, cutting several deep gashes in his head and maltreating him to such an extent that a physician had to be summoned, and Hussey is now confined to his bed. The faculty have instituted a searching examination. Even with this inauspicious start to his college career, Charles Edwin Hussey went on to graduate from Bates College in 1878. The May 1879 issue of Bates' Scarab newsletter had this to say about the recent graduate's upswing in career: "'78. — C. E. Hussey, who has during the past year been teaching the High School at Milton Mills, N. H., has been appointed Principal of the High School at Rochester, N. H." In 1881 he received an MA degree, and expanded his career into Massachusetts. 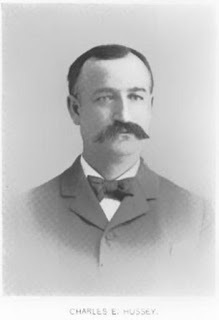 Seen here in a portrait circa 1896, Hussey seems to have toned down his whiskers as a professional adult. I would love to see what they looked like before the attack -- how epic had they become? This photo is from a page-long entry in a town history of Redding, MA. Charles Edwin Hussey (H3/2.2), son of Charles William Hussey (H4/4.2) and Nancy Bickford Davis Hussey (D4/1.1), was born June 16, 1856 in Rochester. He was graduated from Bates College in 1878 with an AB degree and received an MA degree in 1881. He was employed as a school superintendent in New Hampshire and also in Newton, Natick, Wakefield and Reading, Massachusetts. He was married December 25, 1884 to Carrie H. Wallace (W3/1.1), daughter of E. G. Wallace (W4/1.1) of Rochester. She was born February 26, 1862. Charles Edwin Hussey (H3/2.2) became an officer in the U. S. Army during the Spanish-American War. He died October 17, 1915 at Rochester. So hey -- even if you experience whisker-oriented assault, you can still go on to live a productive life. C.E. Hussey is proof of that!